“This set is a treasure for so many reasons that it is difficult to enumerate (or even prioritize) them. I suppose that the most important reason for its significance is the expansion of our knowledge of the art of Camilla Wicks, who did not have the career she might have because of her own reticent personality and her decision to retire and focus on her five children. But it is also a treasure because it will introduce some people to some very important and under-valued pieces of music: Bloch’s First Sonata, Taillefaire’s Sonata, the tiny encore piece by Bjarne Brustad, and some of the other miniatures chief among them. 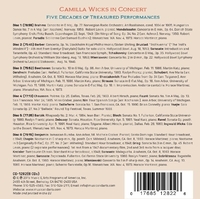 Camilla Wicks was born in 1928 and was, as of this writing (in May, 2015), still alive, having retired from teaching at the San Francisco Conservatory in 2006. She began her career as a child prodigy, débuting with the New York Philharmonic at age 13. In 1951 she married, and for many years after that performed only intermittently because of the demands of raising five children, and of being a wife in the climate of the 1950s. By the mid 1960s, Wicks had so convinced herself that she would not be able to maintain a career that she sold her Stradivarius. Then her marriage broke up and she was left to raise her children. She determined to rebuild her career for reasons probably as much financial as anything else. Her friend Ruggero Ricci gave her a violin, and she began to perform again and also took on more teaching. She never achieved the stardom she merited, though she did make a famous recording of the Sibelius Violin Concerto with Sixten Ehrling. (It is out of print now, and one copy is available at Amazon for just under $400)! What is revealed in this comprehensive survey of Wicks’s career is a front rank artist who merits a greater public reputation than was granted her. Her technique is as close to flawless as humans get, and her intelligence and interpretive breadth are clearly those of a major artist. Early in her career she may well have focused on her virtuosity—the 1946 Hollywood Bowl performance of Wieniawski’s Second Concerto finds her occasionally leaving even the alert Stokowski behind (the excellent notes indicate that Wicks and Stokowski did not get along). Nonetheless, her brilliance in the finale of the Concerto is thrilling to experience. Wicks’s sound is a focused tone, without the plushness of an Oistrakh; it is perhaps closer in sound to someone like Szigeti. She does use a wide range of color and vibrato for expressive purposes. As she matured, her approach to music became more reflective, and the correspondence from Ernest Bloch that is reproduced in the accompanying booklet reveals the enormous respect he had for her. It is a shame that although she learned the Bloch Concerto, she never performed it. But she believed that the First Sonata was the greater work, and the performance here, with very sensitive and alert accompanying from Roslyn Frantz, leaves a major impression on the listener. Wicks is utterly committed to the score, and plays as if possessed. Although it is spread out onto different discs, we do get what must be most or all of a 1986 recital Wicks gave in Ann Arbor, with one of the world’s finest collaborative pianists, Martin Katz. One sign of the musical intelligence of Wicks is the pair of performances of sonatas by Beethoven and Richard Strauss from that same recital. The rigor and discipline heard in the Beethoven G Major Sonata is never rigid, but nonetheless clearly a performance that emphasizes structure and rhythmic pulse. The Strauss Sonata has about it an appropriate freedom and flexibility that demonstrates an artist who digs deeply to get inside each piece of music, rather than slapping the same interpretive profile on everything. She must have loved the second movement of the Strauss (marked ‘Imrovisation: Andante cantabile’) because it appears 13 years earlier on a recital she gave in the state of Washington. These two performances are illustrative of the change in Wicks’ musical outlook, the earlier being more urgent and impulsive, the latter more reflective. Wicks was consistent in her interest in contemporary music, and also Scandinavian music (given her father’s Norwegian roots). She made a brilliant recording of Bjarne Brustad’s Violin Concerto, and regularly performed works by other important Scandinavians like Klaus Egge, Harald Saeverud, and even her father (Ingwald Wicks) whose 'Ode to the Desert’ is heard here, and is quite attractive. The Grieg Sonata, assembled from two performances, is deeply communicative and compelling. There are many other highlights here beyond those already mentioned: The Ravel and Debussy sonatas, the glorious reading of the Fauré, the absolutely unbuttoned ‘Tzigane’ from 1963 in Dallas, the delightful setting of Nin’s Spanish Songs, and the discovery of the early concerto recordings with Fritz Busch and William Steinberg conducting. The Mendelssohn and Tchaikovsky concerti may well have had more reflective performances, but rarely more brilliant ones. Wicks’ technical mastery means that she could concentrate on her interpretive view of the music, without having to worry about how to achieve her ends. Throughout these five discs, one never hears a ‘phoned in’ performance. You might agree or disagree with this or that detail, but you are aware consistently that this is music making that matters, music making where the performer is deeply committed to the idea of communicating her view of the music directly to the listener. 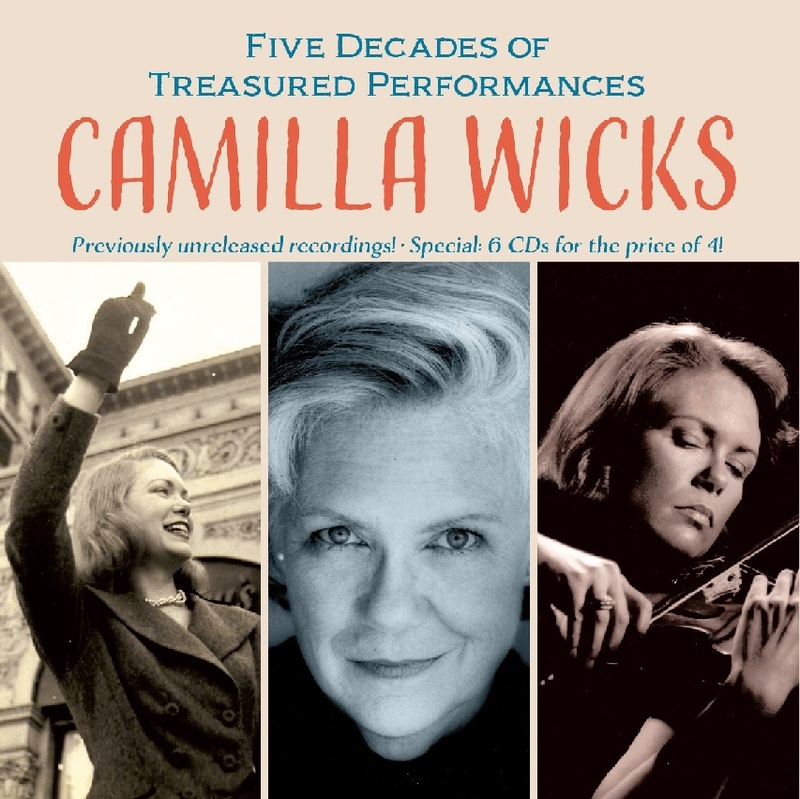 “Upheld by many as a regal presence amongst her peers, violinist Camilla Wicks cultivated a stellar career in the dozen years following World War II. At the peak of her fame she retired from the concert stage to devote herself to her family. Upon resuming her career, she remained an outstanding if intermittent performer for several more decades. This Music & Arts set spans five decades and a vast range of repertoire, the most comprehensive collection of her concert performances so far assembled, a major expansion of her extant discography and an excellent complement to the previous issue on Music & Arts (CD 1160) that features her Beethoven Violin Concerto with Bruno Walter from 1953. The Swiss Ernest Bloch, befriended Camilla Wicks – much as he had violin leader Sidney Griller – whom he had met through the intermediary Louis Persinger, who had encouraged Wicks to master the BAAL SHEM Suite’s ‘Nigun’. The composer himself complimented Wicks on her ‘Nigun’ and upon the Sibelius Concerto, which he praised for its ‘color without any false sentimentality’. The recorded performance of Bloch’s Sonata #1 with Roslyn Frantz will bear fruitful comparison with any of the work in Bloch committed to record by Heifetz, Milstein, Gingold and other select artists of refined taste and immaculate technique. 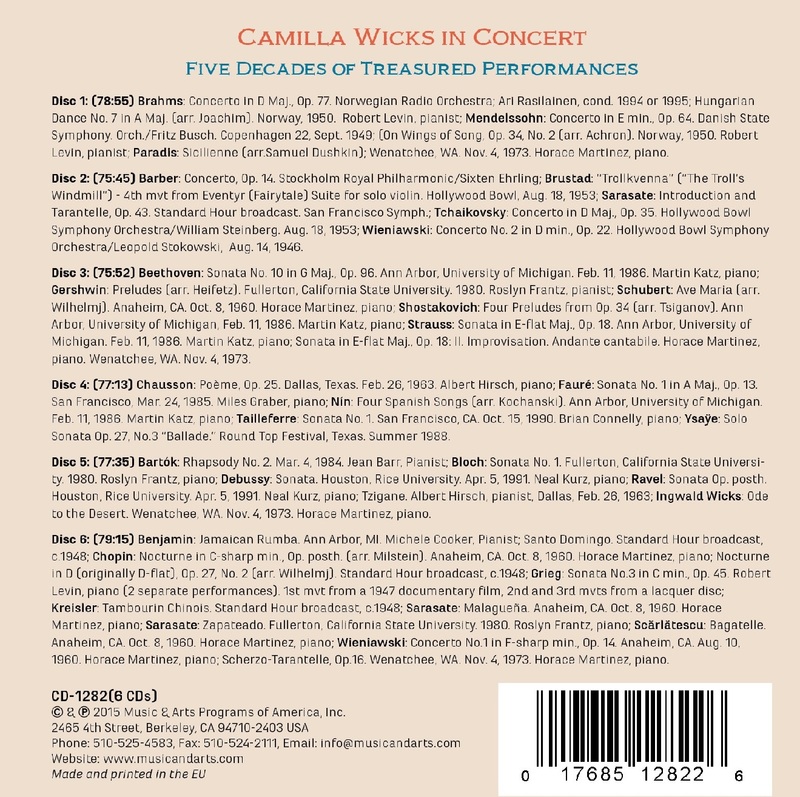 “It’s principally her recording of Sibelius’ Violin Concerto that has kept Camilla Wicks’ name fresh to record collectors, though in recent years a smattering of live and previously unreleased material has appeared to enhance her reputation still further. Now from Music & Arts comes a bonanza for admirers of the American violinist in the shape of a 6-CD boxed set of previously unreleased material. It spans five decades of her performing career, which was interrupted because of family commitments. It’s the most complete index of her concert performances available and the good news for collectors who are long on choices but short on cash is that the six discs are priced ‘as for four’. One of the most exciting things about the collection is the number of concerti and sonatas that are represented. Disc one houses a particularly interesting and early example of her art in the form of the Mendelssohn Concerto with Fritz Busch conducting (Copenhagen, 1949, and in good sound). Busch is a strong, purposeful collaborator and Wicks is sweet-toned and fast of vibrato, and just a bit over-hasty at the end of the first movement. Otherwise this is a youthfully vibrant reading. It’s followed by a performance of the Brahms Concerto dating from the mid-1990s. The conductor is the sympathetic Ari Rasilainen. This is a strong, powerful performance with her ‘forward’ vibrato strongly in evidence; extrovert, incisive, bright – and intonation a tiny bit flat only once or twice. The slow movement isn’t especially introspective but the finale is rhythmically fine. There are two excellent examples of her 1950 partnership with pianist Robert Levin – a saucy Brahms Hungarian Dance #7 and a lusciously voiced Mendelssohn ‘On Wings of Song’. The second disc has two concerti from the years of her youthful brilliance. The first is a rousing traversal of the Tchaikovsky with William Steinberg (Hollywood Bowl Symphony, 1953) which makes its points without any recourse to audience-whipping-up or lurid colouristic devices. The same orchestra supports her in Wieniawski’s Concerto #2 in d minor with Stokowski directing in 1946. The succulent sweet tone is on show here but the collaboration with Stokowski doesn’t sound nearly as successful as that with Busch and Steinberg. Tempi are pushed here throughout and especially in the Romance there’s no room for rubati. The final concerto in this disc is Barber’s with Sixten Ehrling directing either the Stockholm Royal Philharmonic or the Stockholm Radio Symphony. Like the orchestra, the date is unknown. I like this performance. More than most players she distinguishes between the first two movements to stop them sounding like two slow movements bleeding into each other. The result is that she is much quicker in the opening – faster than the man who gave the work its first performance, Albert Spalding, and those who came after who tended to follow his tempi, from Isaac Stern through James Buswell. She’s also defiantly quicker in the slow movement – the quickest I think I’ve ever heard it taken. So, a very differently proportioned reading – and I’m sure many will dissent. It’s good to hear the fourth movement of Bjarne Brustad’s witty ‘Troll’s Windmill’, as Wicks was so fine an exponent of his music. It must have been her encore at the Tchaikovsky concert. Sonatas are a feature of the third disc. There is Beethoven’s last sonata and the Strauss with Martin Katz from the University of Michigan in 1986. Katz is over-recorded in relation to Wicks and he tends to draw the ear too much for comfort. The collaboration sounds somewhat formal and arms-length to me, and rather too metrical. For some reason the Strauss doesn’t soar. Turn however to the earlier 1973 example of the first movement (only) from 1973 with pianist Horace Martinez and her tone is more expressive and honeyed, the performance is quicker, and the rapport palpable. She recorded the Shostakovich-Tsiganov Preludes commercially though it’s good to hear her perform them live; they’re from the same recital with Katz. She plays Heifetz’s arrangement of Gershwin’s Preludes in 1980 with the excellent Roslyn Frantz – very characterful readings. Disc four opens with a very intense Chausson 'Poème' with piano accompaniment by Albert Hirsch....The Tailleferre Sonata #1 that follows, however, is really rare repertoire. It dates from the same city only five years earlier with pianist Brian Connelly. Dedicated to Jacques Thibaud this work must incarnate much of his sunny and sensual character. It’s a work that warms and sometimes darkens but Wicks captures excellently its flirtatious qualities in the scherzo and plays throughout with security and strength Connelly, too, is excellent. This disc ends with another souvenir of that Michigan concert with Katz, namely the Nin-Kochanski ‘Spanish Songs’. There are more sonatas in disc five, which begins with a powerful and passionate reading of Bloch’s Sonata #1. It’s very well worth reading the notes in detail because they contain quite a chunk regarding the professional friendship between Bloch and Wicks, and there is much to ponder. The recording quality is pretty good and once again Roslyn Frantz is an admirable pianist and contributes her fair share to the success of the reading. Wicks and Neal Kurz play the then little-performed Ravel Sonata Op.posth. and this is followed by the Debussy which, in the modern manner, is relatively slow; relative, that is, to Thibaud, to Dubois, and to Francescatti. Of its type it’s a good performance. The Bartók Rhapsody #2 comes from 1984 and is sufficiently resinous....It’s enjoyable to her self-announce a work by her father, Ingwald Wicks – the evocative ‘Ode to the Desert’. There’s a bit of a mystery about the composite Grieg Sonata in c minor that opens the final disc. The first movement comes from a 1947 documentary film whilst the second and third movements come from lacquer discs, possibly deriving from live performances....Wicks and Levin are heard at their most youthful here. She was still performing slightly Old School recitals with piano-accompanied concertos as late as 1960. With Martinez she gives a dashing Wieniawski #1 dealing excellently with the torrential and here very much exposed technical demands.